After months of training, the women of the West African Djerma group are ready to compete in the traditional Hangandi Festival. The winner takes home prizes, bragging rights, and the most coveted prize of all – food. Unlike the popular beauty pageants lauded around the world, the Hangandi is looking for the contestant with the most corpulent figure. Djerma women spend months eating, especially cereal crops and grains, and drinking large amounts of water days before the contest. Those who take the festival very seriously even have caretakers that massage their growing body as they gain weight to ensure a nice, round shape and perfect placement of bulk. Much like women in the West who will go to extremes in the pursuit of the “perfect body,” some Djerma women use unhealthy (and often dangerous) means to achieve the weight gain they desire. Women looking to add bulk have taken to using medication meant for fattening livestock. Doctors in West Africa strongly advise against this method, drawing many similarities to the weight loss pills and crash fad diets that have created a $66 billion dollar global weight loss industry. Reader’s Digest cited that over 58% of women in the US voiced concern that being considered overweight or plus-sized hindered their daily lives, whether that be in their careers, dating or travel. 58% was the highest rate seen throughout this poll taken in many major countries. More than ever, people are dieting, using medication or investing in surgery to reduce their body weight – with the estimated number of active dieters in the US hitting 97 million this year. While body positive campaigns continue to build, the concern for controlling body size and weight continues to grow as well. Clothing sizes larger than a size eight are considered plus size in the fashion industry. The women vying for the title of the Hangandi festival would laugh at this kind of thinking – weight literally carries weight in West African culture. Your size tells others how lavish your lifestyle is; how able your family is to provide enough food and time for leisure to maintain your figure. 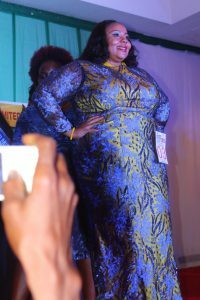 Neighboring country, Nigeria, often holds beauty contests centered around celebrating full figured women. 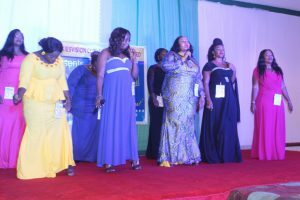 Dubbed “Miss Big World”, these pageants aim to showcase and celebrate the elegance and beauty of plus size women, all while promoting tourism to Africa and the richness of culture. These events hope to reshape how women’s bodies are judged and reclaim the often unattainable standards that are put on weight and body shape. We can’t ignore that there are still some patriarchal overtones to these pageants, with women maintaining a larger figure in pursuit of male admiration (or sometimes demand) and external opinion. Most Western beauty standards are about public approval, and even though there is a stark difference in the type of figure that is valued, the Hangandi still hinges on the judgement and endorsement from others. However, it is very refreshing to see full figures not only embraced, but celebrated and rewarded.